For seven innings, the Cincinnati Reds’ bats fall asleep again. The 14-run game on Tuesday seemed like a distant memory. The Reds had one hit and no runs over the first seven innings. That all changed when Jose Iglesias stepped to the plate to start the eighth. After making two run-saving plays with his glove earlier in the game, he provided more heroics by launching a game-tying solo home run. Two batters later, Jesse Winker put the Reds ahead for good with his second bomb in as many days. 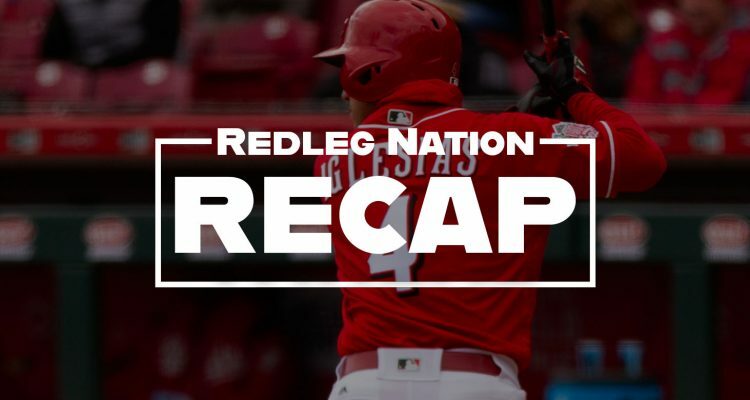 The Reds are on their first official winning streak of the 2019 season. One day after setting a team record for most balls hit at 100+ mph in a game, Reds batters had trouble squaring up anything. Marlins starter Trevor Richards was wild (five walks) but allowed only one hit — a first-inning single by Matt Kemp — and limited hard contact to keep Cincinnati off the scoreboard. The Reds scrounged together only three batted balls considered “hard” contact by Statcast (95+ mph exit velocity) against Richards — two by Winker and one by Eugenio Suarez. The Reds still had their chances, however. Four of Richards’ walks came to the first eight hitters he faced. In the first inning, he loaded the bases with one out, but the Reds couldn’t take advantage. Scott Schebler popped out to center field with one out and Joey Votto was thrown out at home trying to score on a sacrifice fly. They threatened again in the second, putting runners on second and third with two outs, but Winker flew out to end the inning. From there, Richards pulled it together, retiring 12 of the next 13 batters while picking up six of his seven strikeouts. But it all turned around in the eighth. Iglesias, who had only 21 career home runs before tonight, launched the fourth pitch he saw from reliever Drew Steckenrider over the right-center field wall to tie the game at one. It was his first career home run to center field. Winker followed with a go-ahead shot that looked eerily similar to his homer on Tuesday. 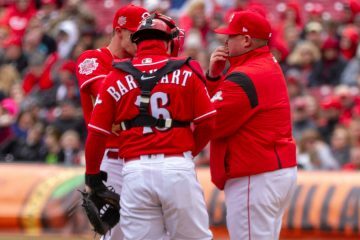 It just squeaked over the left-field wall, but it was enough to push the Reds to a win despite managing only three hits. Tyler Mahle was not as sharp in his second start of the year, but he battled through problems with fastball command to throw five innings of one-run, two-hit baseball. The right-hander fanned seven and issued four walks on the night. Most of Mahle’s struggles came in the first two innings, during which he gave up all four free passes. With some brilliant defense behind him (more on that later), he escaped without any damage. Neil Walker tagged Mahle for a solo home run in the third inning, but that was the only tally the Marlins could scratch on the scorecard. Over his last three innings, Mahle retired nine of the 10 batters he faced, striking out five of them. Because he was struggling with his fastball command for the first half of his start, Mahle relied more on his slider. He threw it 21 times tonight — 23% of his pitches — though it wasn’t very effective (1 whiff, 2 called strikes). Mahle turned back to his fastball down the stretch and regained his feel for it. He struck out the side in the fourth inning, with the final punchout coming on his new splitter/changeup. It will be interesting to see if he uses it more moving forward. Mahle threw it only four times tonight. Jared Hughes also struggled with his control. Although he walked only one batter, he got into three-ball counts against five of the seven hitters he faced. Still, he didn’t allow a run, a welcome sight amidst a shaky start to the year. He struck out two and allowed an infield single. After a two-out walk to old friend Rosell Herrera, Hughes was pulled for Amir Garrett. As he’s been in every appearance of 2019, Garrett was filthy. He breezed through four outs, striking out two and keeping Marlins hitters guessing with his sweeping slider and high-90s gas. After looking more like his usual self in his last outing against the Pirates, Raisel Iglesias slammed the door in the top of the ninth inning. He got his first save opportunity of the year after the Reds took the lead the previous inning. It took him no time to lock up his first save. Iglesias mowed down three batters in a row on strikes to seal the win. Six of his 14 pitches resulted in swings and misses. Filthy. The Reds’ haven’t impressed much in the field in the early going, but don’t lump Jose Iglesias into the group of those who’ve struggled. The shortstop made a pair of dazzling plays in the opening two innings to save runs for Mahle. In the first, he made a diving stop on a 103-mph ground ball by Starlin Castro and flipped the ball to Derek Dietrich to start an inning-ending double play. Iglesias was at it again in the second. With the bases loaded and two outs, Iglesias covered around 75 feet to stop a slow roller on the right side of the infield as he was pulled over in a shift. With no other choice to prevent a run, he made a glove flip to first base to retire Curtis Granderson and keep the game scoreless. Reds pitchers struck out 14 batters tonight, a season high. The previous high came on Tuesday, when the staff punched out 12 Marlins hitters. If the pitchers manage at least 12 strikeouts for a third straight game tomorrow, it will be the fifth time that’s occurred in team history. The record streak is four, which was amazingly set in the 2015 marred by horrible pitching. The Reds, of course, went 0-4 in those games. A matinee affair will conclude the Reds’ three-game series on Thursday. Coming off a sensational outing in Pittsburgh, Sonny Gray (2.89 ERA, 4.17 FIP) will get the ball for the home team for a chance to sweep the Marlins. Pablo Lopez (6.10 ERA, 3.29 xFIP) will take the ball for Miami. First pitch is set for 12:35 p.m. ET. Seems pretty obvious that Bell and Puig are the problem. And look what happened. The offense and pitching both got worse. Perhaps it was Puig’s antics that woke the team. God knows this tweam has need some passion for a long time! Only caught the bottom 5th onwards. Looked good. Puig back tomorrow, should put Kemp to the Bench. Lets go for the Sweep. If the Pirates continue beating up on the Cubbies we will no longer be alone in the cellar when the night is out. Puig back tomorrow … hopefully with a vengeance. I was at game . Iglesias defense is out of this world. There was also a breeze blowing from right center field and his HR went straight through it. Winker’s HR in the 8th was hit hard … Raisel Iglesias looked great, especially with his 85 mph sliders. Mahle gutted it out, but doesn’t seem to have a put away pitch. Great win. I am 2-0 in games attended. Get out to GABP. It’s a good time. Didn’t Mahle have quite a few strikeouts ? Doesn’t that mean he has a put away pitch ? This was my thought. He had 7 K’s in 5 innings. From my perspective, it looked more like he just couldn’t locate his fastball early in the game, but then got a feel for it after the solo HR. He walked 4 in the first 2 innings, had 60 pitches after 3, but escaped 1 inning with a great double play ball by Iglesias, another by striking out the pitcher. He struck out the side in the 4th which gave him some momentum. Lewis Brinson was 0-4 with 4 k.
I don’t know if it was on here or somewhere else but someone was advocating sending Winker down because they thought his shoulder wasn’t up to par. The dude is hitting it harder than anyone on the team and has been the whole year. Just like the people who said to send Luis Castillo to AAA since he struggled in spring training. Regarding Winker, I was one of those who said he should be sent down and speculated that his shoulder wasn’t 100%. I hadn’t looked at the exit velocity data so it looks like I was wrong. Neither the first nor last time I’m afraid. Kudos to you. A person on a message board or social media platform acknowledging a take or opinion might have been wrong might be rarer than a unicorn. That suggests you’re one of the more mature and credible posters, and someone whose opinions should always be seriously considered. That TangoTiger thing graph was interesting. Yeah, that analysis seems like a second-guesser’s tool. It’s not like either Votto or the coach can calibrate the distance while standing at third base. They barely got him at the plate. There really isn’t anything usefully analytical about a finding that it is riskier on average to run on a guy making a short throw. Having said that, and not knowing much about the CF’s arm, I wouldn’t have tried it with Votto. But if it’s that close, it wasn’t a tootblan. I don’t know about the tool, but to my intermediate-level baseball eye, it looked WAY too short to send Votto. And I’m not saying he was out by a mile, but it wasn’t really that close either. He didn’t have much of a chance to score at all. I’d like to call attention to the Reds revamped social media strategy. Their Twitter account has been on fire. So will the Reds be buyers at the deadline if they get things together? I would say ‘mild buyers’. Don’t expect them to break the bank prospect wise, but expect a mild pick up. A look at Kimbrel if he is still available is also possible. Of course, I was excited with the win. But there was something I noticed that made me more excited. Jose Iglesias ran around the bases fast after his homer, as if showing true excitement and joy. Then, Jesse Winker, while rounding the bases after his homer, showed true excitement on his face. After he crossed the plate, he and Iglesias did a leaping high-five that wasn’t one of the choreographed celebratory hand and arm bumps we have often seen in the past. (Not that there’s anything wrong with that.) 🙂 I saw from Winker and Iglesias the kind of true unfiltered joy that we as fans often experience. My perception of that was that perhaps these guys are more engaged emotionally than in the past, despite being 2-8 (at the time). Maybe they have developed an inner belief they can win, and the emotion showed last night was the joy that maybe they are beginning to right the ship onto its proper course. Yes! I noticed and admired that too. Also, both of Winker’s HRs have been to LF. He’s seeing the ball well. It’s going to come around. Its a game. Lets have some fun! I also found it interesting that Dietrich played the ninth inning in left field. He played there a lot last year with the Marlins, but I don’t believe he played it a lot in spring training this year. This roster has a lot of versatility at David Bell’s disposal. More of an obvious decision. Kemp is a huge defensive liability. One final point: Who’s a better defensive shortstop in the NL than Iglesias right now? Maybe Arcia at Milwaukee? We haven’t seen Tatis yet from San Diego. Thoughts? Funny you mention SD. The Reds play them one week from today for a 4 game series. I’m looking forward to see how the Reds stack up against LAD and SD next week. A good road trip and things look better. A bad road trip will set them up for a putrid April. It will put them behind the 8-ball early. Nine games on the road trip. A 5-4 record or better would be preferable. Even 4-5 would be acceptable. But a 3-6 or worse trip puts them in a deep hole. May’s schedule doesn’t get any easier. 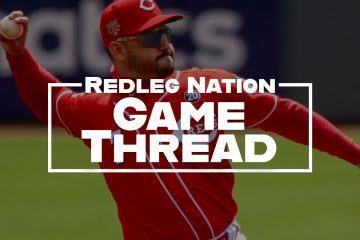 If the pitching continues to holds up, the Reds look like a club that could go on a tare at anytime and many times over the course of a season. I’m not overly concerned at this point – great, good or bad road trip to the coast. Pitching is still the key ingredient to success. A 20-8 May would erase many sins. “hold” and “tear”. I’m in need of spellcheck or edit feature. We know Winker is not fast and his defense at best is average. But the guy works the count to get his pitch, and he can hit. He should be a regular in the lineup either in the outfield or as a backup to Votto at first base.